2019 is no different as every year thousands of Canadians decide to go abroad for work. As the second largest economy in the world, China is often the destination of choice for many Canadian individuals as well as corporations. Whether you want to teach English in China or partner with a manufacturing company in China, you are going to be asked to provide some types of Canadian documents for the certification process called authentication and legalization. In addition to getting a worker’s Visa, you will need to provide documents such as your Canadian university degree, diploma, and police clearance certificate from Canada to the appropriate Chinese authorities as part of the employment application or renewal process. Similarly, any Canadian corporation doing business in China will require authentication and legalization of documents such as a certificate of incorporation, director’s resolution, or articles of incorporation to name a few. These various documents for the China authentication and legalization process are all quite easy to get if you do not already have them available. Degrees, diplomas, and any other educational documents for use in China can simply be ordered from the appropriate educational institution in Canada. Police checks can be attained at your nearest Canadian police station and will need to be notarized by a Canadian Notary to be valid for processing. However, it is recommended to attain an RCMP certified police check issued by the RCMP Headquarters in Ottawa and based on a search of your fingerprints since it is often more thorough than local police check and is usually the type preferred for international use. Corporate documents can be drafted by a lawyer and will also need to be notarized. Some corporate documents can be obtained from federal bodies such as Health Canada or Industry Canada which is now called Innovation, Science, and Economic Development Canada. Once you have the Canadian documents you will need to use for work in China or for doing business in China, as mentioned you will have to go through the authentication and legalization process to make them valid for use in China. So what is the authentication and legalization process and why do I need it to work in China you may ask? This process is to make documents valid for use overseas and sometimes referred to as an apostille in some countries although in Canada and China it is referred to as Global Affairs Canada authentication and then legalization, also called Consular Authentication, at the Chinese Visa Application Service Center here in Ottawa. This is because Canada and China have not signed the Hague apostille convention so they both still uses the original 2-step authentication and legalization process which was used by apostille countries prior to the convention. In short, authentication and legalization are equal to an apostille and it is recognized as such by authorities around the world. The process of China authentication and legalization can take a considerable amount of time and can be very complicated and frustrating for a nonprofessional. There are numerous requirements at both steps and the total processing time can easily exceed 3 weeks even without mistakes or if you have the wrong documents. With Global Affairs Canada taking up to 20 business days to authenticate a Canadian document, if there are no issues with it, most people have exceeded their time line to have their Canadian documents validated for their new employer or business opportunity in China. This is in addition to the Chinese Visa Application Service Center processing time for consular authentication and shipping back to you, or onto China, which we can do to save you time. To add to this the embassy of China has recently made significant changes to their consular authentication process. This tends to happen frequently with most embassies but in this case the change has made processing Canadian documents for use in China very difficult for many people. 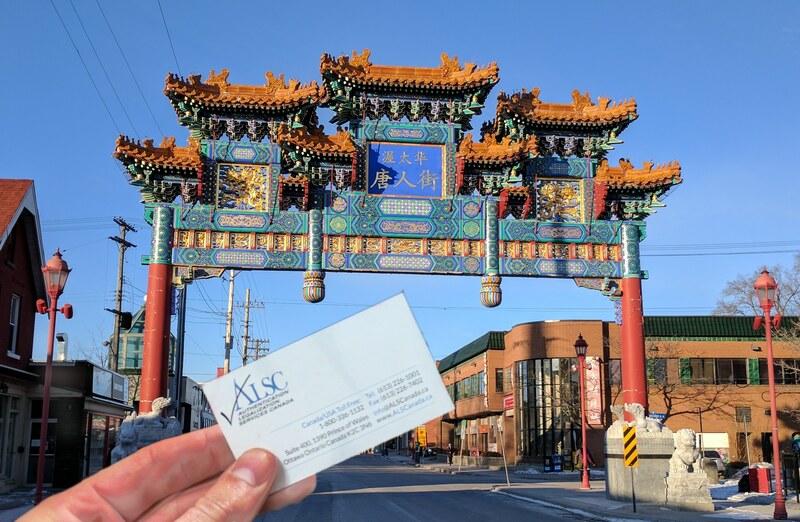 At Authentication Legalization Services Canada (ALSC) we are always up to date with changing consular requirements, fees, and processing times for China. As Canada’s leading experts for China Consular authentication we know exactly what you will need to have your documents certified and validated for use in China and we are here to help. 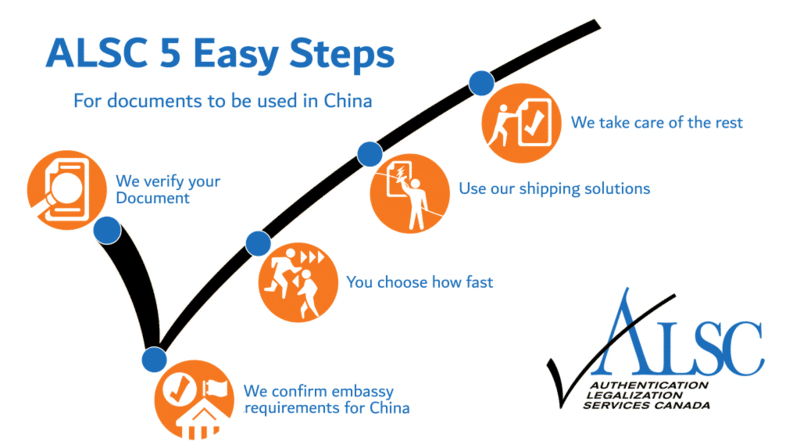 At ALSC, our professionals are here to take care of this complicated process for you and ensure your documents will be valid for use in China. With our expert help and fast service, you can have your documents authenticated at Global Affairs Canada as quickly as the same day they arrive in our office. This means your documents will be ready for China consular authentication the next day saving you weeks of processing time. When you choose our services, you have Canada’s international document experts on your side providing you peace of mind, with regular updates throughout the process, and an experienced agent one phone call away to answer your questions. Our proud membership with the Canadian Chamber of Commerce, our A+ rating with the Better Business Bureau, and multiple 5-star Facebook and Google reviews validate our position as the leaders in our industry. If you have Canadian documents that need to be used in China for employment or for business purposes, click below to get the China Consular Authentication experts on your side.